Libya was the first country in which bombs were dropped from an aircraft during a conflict. The year was 1911 and the bombers were Italian fighting the Ottoman Empire for control of what was at that time one of their provinces. The use of this advanced technology gave the Italians a distinct advantage over the Turks, but led to a huge escalation in costs making the war much more expensive than had been anticipated. To pacify their newly conquered territory, which was now a drain on their resources, the Italians continued to use bombing missions against tribesmen and imprisoned tens of thousands of Libyans in concentration camps – the methods of Muammar Gaddafi might have been reprehensible but they weren’t particularly original. But it was the use of air power as a cheap and effective way of maintaining power that caught the attention of other powers. The British took particular note and developed their own skills in the techniques in Iraq. One of the students of the new science there was ‘Bomber Harris’, who later put what he had learned to good use in the fight against Germany. The Libyans were able to get rid of the Italians following the Second World War, but not of Europeans with aircraft. Both the US and the UK had air bases in Libya in the fifties and sixties. It was Colonel Gaddafi put an end to this, so the use of British airpower to get him had a bit of the character of a grudge match. It is an obvious idea that the Western allies so keen to see the Colonel go were motivated by the desire to get control of Libya’s oil. And that may well have been what they were mainly after, though it doesn’t seem to have been a problem getting oil out of Libya at any point in the last 40 years. But given the history of Libya’s role in helping train people in the art of bombing I wonder if there is maybe another reason? Would Libya make a convenient airbase again? Technology has moved on. The big thing now is drones. Drones are much cheaper than manned fighters, and can be automated to astonishing degrees reducing the need for manpower. Or alternatively by supporting them with large crews on the ground, they can carry out functions that would be impossible for aircraft with only as many men as can be got into the machine itself. Either way, it reduces the cost of fighting overall. And in addition to the economic savings, the political savings are large. The men flying the plane are thousands of miles away in Nevada. There is no risk of facing pilots captured and held hostage or returning home in body bags. This was always the appeal of air power. You can fight a war without coming into direct contact with the enemy, and they aren’t able to fight back. The development of drones just makes this even more pronounced. The enemy can be made to suffer with no more effort than that involved in playing a particularly long video game. So the process that the Italians started in Libya continues apace. Is it possible that Libya is once again going to be at the centre of developments? 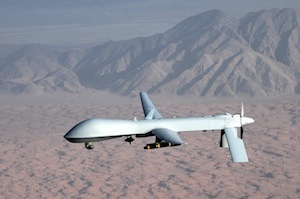 Drones based in Libya could rapidly be deployed to some of the world’s trouble spots. While the Middle East is an area of strategic significance, Africa has some hot spots. Places like the Horn of Africa might not hold resources crucial to developed countries, but they do provide some great training opportunities. Is this what has lured the planners in the Pentagon to get involved with regime change in an otherwise not particularly troublesome country?